Representation of a property consisting of a name and value(s). Note that this property is immutable, meaning that the property values may not be changed through this interface. This class is designed to be used with the ValueFactories interface and the particular ValueFactory that corresponds to the type of value you'd like to use. The ValueFactory will then return the values (if no type conversion is required) or will convert the values using the appropriate conversion algorithm. Meanwhile, the long value factory converts the values to long, the date value factory converts the values to DateTime instances, and so on. This technique is much better and far safer than casting the values. It is possible that some Property instances contain heterogeneous values, so casting may not always work. Also, this technique guarantees that the values are properly converted if the type is not what you expected. Obtain the property's first value in its natural form. Obtain the property's values in their natural form. Obtain the property's values as an array of objects in their natural form. Determine whether this property has no actual values. Determine whether the property currently has multiple values. Determine whether the property currently has a single value. Get the number of actual values in this property. Get the number of actual values in this property. If the property allows multiple values, then this method may return a value greater than 1. If the property only allows a single value, then this method will return either 0 or 1. This method may return 0 regardless of whether the property allows a single value, or multiple values. true if the property has multiple values, or false otherwise. true if the property has a single value, or false otherwise. Determine whether this property has no actual values. This method may return true regardless of whether the property allows a single value, or multiple values. This method is a convenience method that is equivalent to size() == 0. Obtain the property's values in their natural form. This is equivalent to calling iterator(). A valid iterator is returned if the property has single valued or multi-valued. 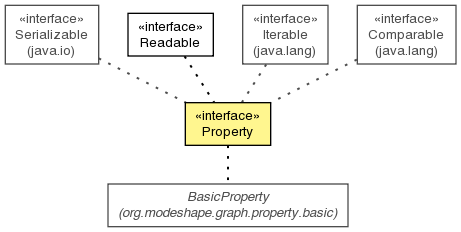 The resulting iterator is immutable, and all property values are immutable. A valid array is return if the property has single valued or multi-valued, or a null value is returned if the property is empty. The resulting array is a copy, guaranteeing immutability for the property.